Move over, Maria Callas: Two of the world’s largest hotel companies, Marriott and Starwood, have just begun offering a series of master classes. Experts from various fields from singing to sports will offer private, interactive learning experiences, which the hotels will offer to members redeeming points they’ve earned from frequent stays. So, why would a hotel company bother to curate a complicated roster of one-off events which, by definition, will only accommodate a handful of members? These brands (in the midst of a merger) want customers to keep coming back to their hotels. And what’s the best way to build loyalty among customers? The 2017 Colloquy Loyalty Census Report released this summer found that the #1 motivator for participating in a loyalty program is when a customer “loves the brand, company, retailer or service.” By offering aspirational, personal experiences like these, the hotels are fostering that bond between their brand and consumers, including members who attend now and—importantly—the larger pool who hope to attend in the future. 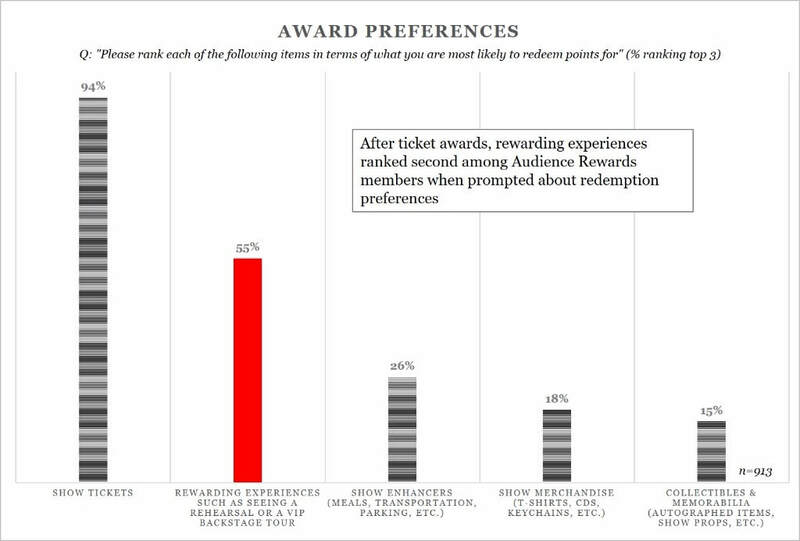 According to research by LoyaltyOne, 1 in 4 consumers ranks “member exclusives” in their top 3 most appealing rewards. Here on Broadway, interest is even higher, with over half of Audience Rewards members surveyed ranking VIP experiences among their most appealing rewards. Our recommendation? Take a cue from these global brands and find creative ways to strengthen ticket buyers’ connection with your show. Offering a peek behind the scenes can generate a lot of extra interest, increasing your week-over-week sales from Audience Rewards members up to 2x when an event is promoted. Learn more about Audience Rewards at www.AudienceRewards.com.